Honey Banana Bread landed on the menu unexpectedly. Wheels set the quart jar of thick amber liquid on the kitchen counter. Organic honey sold by the grandfather of a fellow employee. A quart jar!!!! That is more than we’ve used in the last five years total!!! A quick taste showed that it had a pleasant flavor, but not at all like the honey in the little squeezy bear. Well – love me a challenge (and Wheels is really good at bringing them on!) I hit the search engines. According to honey.com, the website of the National Honey Board, “The 60,000 or so bees in a beehive may collectively travel as much as 55,000 miles and visit more than two million flowers to gather enough nectar to make just a pound of honey! The color and flavor of honey differ depending on the bees’ nectar source. . .”. The darker the honey, the more “robust” the flavor. Marveling, at all the time and energy that went into making a quart of honey, I was briefly sidetracked by the freebies on the site. They also have recipes, and one of them, inspired me to narrow my search down to banana bread. An inspiration furthered fueled by the slightly darkened bananas in the dining room fruit bowl. Banana bread is a particularly personal recipe. And I didn’t have the whole wheat flour on hand that most recipes seem to think went with honey. Honey has 17 carbs per tablespoon, 5 more than a tablespoon of sugar. But it is also sweeter, meaning less is needed so the end result of choosing one vs the other is about the same. Some recipes called for both! Finally— yep – I took a bit from this recipe and a bit from that and mooshed them together! And the results were pretty tasty, if I do say so myself. But most of the credit goes to the honey flavor. A couple of cautionary notes about banana bread: 1) Turn the oven on before making the recipe so it is preheated. I flake over this step on a lot of recipes, but it is important here. Grease your pans right after you turn the oven on. Getting the bread in the hot oven right away is important. 2) Mix the dry ingredients together before stirring them into the wet ingredients, so they are evenly distributed. You can do this by dumping them all in a pile on top of the wet ingredients and gently stirring them together before pulling in the wet ingredients. OR by mixing them together in another bowl before adding. These two notes are for the same reason. The leavening agent – baking soda- begins to work as soon as it gets wet in this recipe. You want the result to make the bread light as it bakes. Wasting the leavening power as the bread sets on the counter waiting for you to preheat, grease or stir it away makes a heavy, doughy product. I also know most recipes say to bake this size recipe in a single 9×5 greased pan for 50-65 minutes. For me, most of the time this results in underdone loaves and big slices that I usually cut in half. I prefer smaller slices and a shorter baking time. With less batter in the pan, I also think the loaf bakes more evenly. If you want the bigger slice – be my guest! And nuts are another banana bread particular – at least in our house. Bytes will eat walnuts from the bag, but putting those same nuts in a recipe is a guarantee it will never cross his lips and sometimes, that’s a good thing. Do you know how much a big guy can inhale in a day?? Sometimes a few well placed nuts is a survival strategy. I digress – some people like nuts, some don’t. I had about a half cup of toasted walnuts that I tossed in one half of the dough – yum. Eat plain, with a bit of butter or whipped cream cheese. Two loaves will yield about 36 half inch thick slices about 11 carbs each. This recipe was featured at Kristen’s Creations and mentioned at Petite Hermine. Thank you! Preheat oven and lightly grease two 9x5 inch loaf pans. Mix together applesauce and honey. Mash bananas. 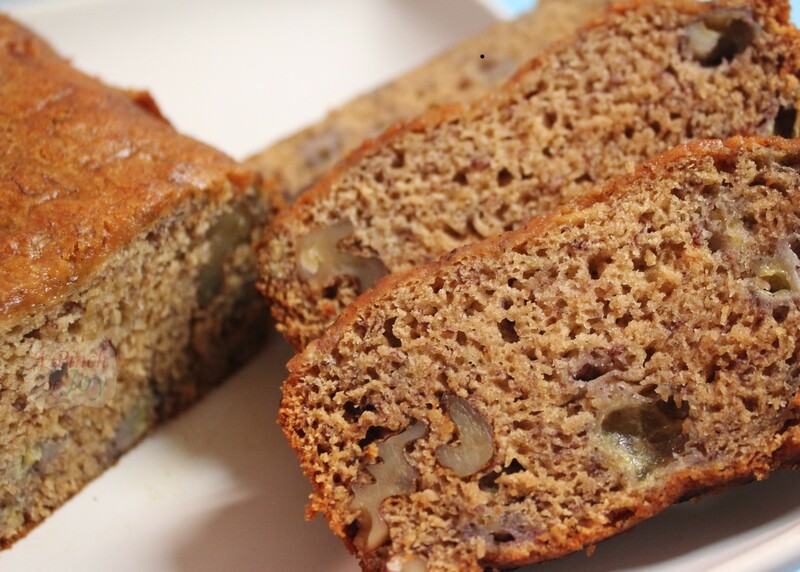 Overripe bananas work well for this purpose. Add bananas and eggs to applesauce and honey mixture and mix until well blended. Add flour, baking soda, cinnamon and salt at the same time – do NOT stir ingredients in one at a time. Mix just until dry ingredients are moistened. Divide batter evenly between the two prepared pans. Bake at 350 degrees for 30-40 minutes, until a toothpick inserted into the center of the loaf comes out clean. Let bread cool 5-10 minutes in the pan and then turn out onto a wire rack. Welcome to a Pinch of Joy! I hope you’ll take a few minutes to look around. Follow A Pinch of Joy using the icons on the teal bar at the top of the page so you don’t miss a thing! I’d love to have your company on this venture!! Share: if you found this helpful or inspiring please click one of the sharing buttons below! Your support of A Pinch of Joy is appreciated! I just made your honey banana bread recipe. It is delicious! I made it in a muffin tin but used the exact recipe. This is my effort to get away from the use of white sugar. Love love Love Banana Bread! Thanks for sharing it with Six Sister’s Stuff Link Party. We hope to see you back next Saturday! This looks amazing! Thanks for sharing it with Six Sister’s Stuff Link Party. We hope to see you back next Saturday! I really enjoyed your post about Honey and the Bees. Your Honey Banana Bread looks delicious, I plan on making it very soon. Thank you so much for sharing with Full Plate Thursday and have a great week end! 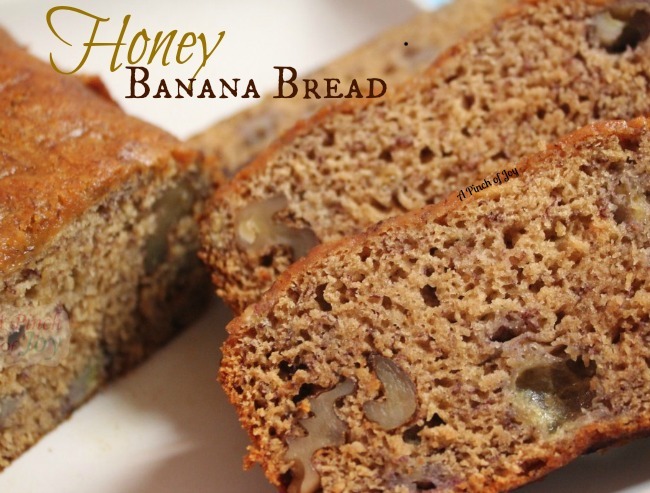 I love any kind of banana bread – but never had it with honey. Looks so good and thanks for the recipe. Thanks for sharing your creative inspiration over at Sunday’s Best Par.tay! Sorry I missed you party, by the time I got there you link was closed. It’s been crazy moving into my new booth – so feel like everything is getting away from me. I promise to be there for your party on Monday. Yummo! I love the idea of adding honey to banana bread. Thanks for sharing this recipe. I Love Banana Bread… but with HONEY? That sounds amazing!!! We would love for you to share this on our Saturday Link Party at http://www.SixSistersstuff.com. Hope to see you there! Just found you through Blue Cricket. I buy hamburger in big packages and freeze it also. An easy way to cool the burger down once it is cooked and divided is to go ahead and seal the bag while the meat is hot. Squeeze out as much air as you can and place the bag in a container of ice water. I thought, when I first heard about this tip, is why? Just how much time can it really save and guess what!? It saves a lot and you can get your food in the freezer faster and finish the task. Use your sink or a large bowl or tub or as I do, my cooler that we take to the beach. It has a spout on it to drain out the water once all the ice has melted. Try it and let me know.